While veneers are a popular option to improve the color and look of a tooth, some situations require an alternative solution. 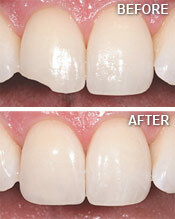 Dr. Belongea and his Littleton team often choose dental bonding to repair minor defects and damage. This procedure offers beautiful results with less time and complexity than veneers, and may allow younger patients time to grow before choosing a more permanent solution. Let’s explore the benefits of bonding and the applications where bonding is preferred. Because it does not involve dental laboratory work, tooth bonding can usually be accomplished in a single visit to the dental office. Expect the whole procedure to take 30 minutes to an hour. 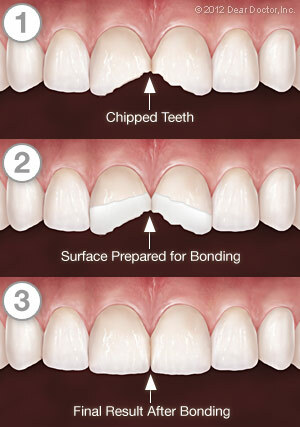 First, we will clean the surface of the tooth to be bonded so it is plaque-free. Dr. Belongea will then need to “etch” the surface with an acidic gel that opens up tiny pores in the surface. After the etching gel is rinsed off, the liquid composite resin in a well-matched shade is painted on in a thin layer, filling these tiny pores to create a strong micromechanical bond. A special curing light is used to harden this bonding material. Once the first layer is cured, another layer is painted on and cured. We will continue to build up layers until the restoration has the necessary thickness. Dr. Belongea will then shape the bonding material using a dental drill to give it just the right form. Once we are satisfied that the tooth not only looks great but fits in perfectly with your bite, we will give the bonded tooth a final polishing. If you have questions about bonding, veneers, or other cosmetic dental procedures, call or email Southwest Adult Dentistry today. Our team will be happy to answer questions, or schedule an exam with Dr. Belongea to get your treatment started. Don’t let minor defects get you down! Let us help you improve the look of your smile today!